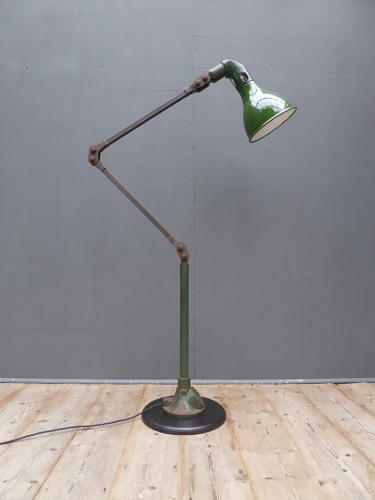 A fantastic example of an original vintage industrial Mek Elek floor lamp. A beautiful large Mek Elek lamp in original paintwork with a fantastic patina, boasting the usual exceptional Mek Elek build quality. Beautifully engineered with a glossy green & white enamel shade, cast iron base & wonderful serrated joints unique to Mek Elek lamps. Wear commensurate with age, overall very good with favourably worn, clean to the touch paintwork & a good shade. The lamp comes mounted on a turned hardboard plinth from which it can be removed on request. Measurement given(155cm) is a flat out measurement & overall height or reach depends on position, the lamp measures around 116cm as per the main image.